"Houston, Tranquillity Base here. The Eagle has landed." Neil Armstrong as Astronaut was part of a team on many missions prior to a feat that will forever be his marker in history as the first man on the moon. Neil Armstrong, characterized every ideal that Americans aspire to bravery, humility, intellect, bold, exploration and American Excellence. America is less for his loss. 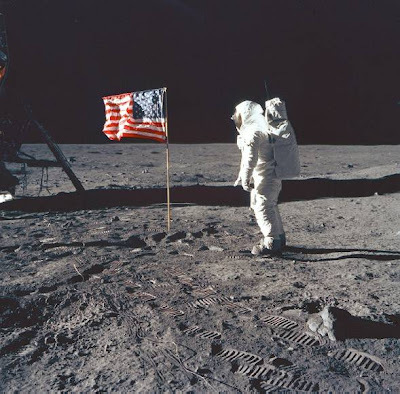 When I was 22, I watched Neil Armstrong place the first of many American Astronauts footprints on the that beautiful pearl in the sky, the moon. A feat 43 years later no other nation has been able to duplicate. My Grandfather who was 93, watched with me and my family in amazement and pride at America's milestone technological achievement. NASA's comments on the death of Neil Armstrong can be found here. I share your mixed feelings. Regrettably, he has ravaged more than NASA, as you know!